CLHS has a long history of award-winning band and choir groups and noted artists and thespians. During this Fine Arts Week, students in the band, choir, visual and media art classes, drama and yearbook will have a chance to showcase their work throughout the school and to the community. FORT WAYNE, Ind. 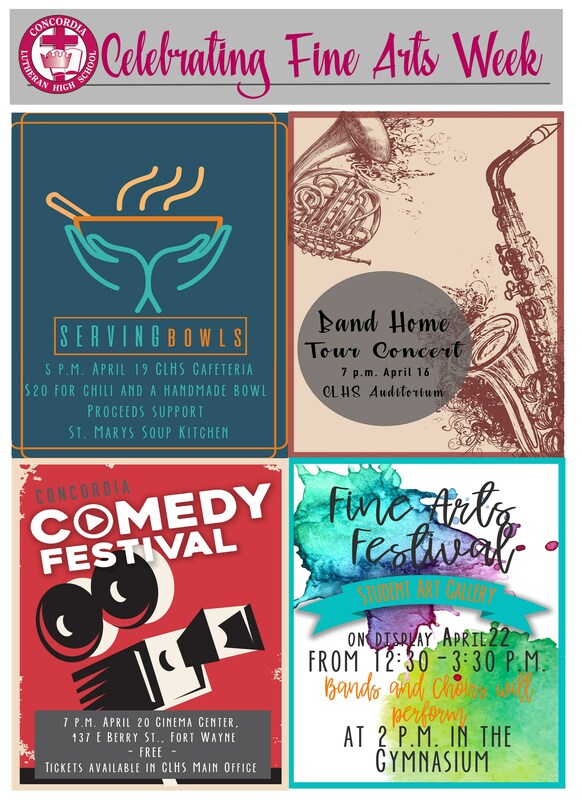 — Concordia Lutheran High School is celebrating the fine arts with a week full of activities beginning April 16. There will be an assembly on April 19 featuring the variety of arts at Concordia, including choral and instrumental music, visual and media art, yearbook and drama. The week will kick off with the Band Home Tour Concert Band Home Tour Concert at 7 p.m. April 16 in the CLHS auditorium. The concert is free, and open to the public. The SERVING Bowls Chili Fundraiser will take place from 5-7 p.m. April 19 at the high school. For $20 each, you will receive a handmade pottery bowl and a chili dinner (get their early for your choice of bowls). All are welcome. The proceeds will benefit the St. Mary’s Soup Kitchen. And then at 7 p.m. April 20 is the Concordia Comedy Festival. This event will feature the finalists from our high school and middle school film submissions. The event is free, but tickets are required because of limited seating. They are available in the CLHS main office. Finally, finish off the week with the Fine Arts Festival from 12:30-3:30 p.m. April 22. Along with the Lutheran elementary art and music students, the high school band and choir students will perform, and artwork will be displayed around the school. The concert will take place at 2 p.m.